We have explained the origins of a large banner donated to Canada by Lord Grey in a previous blog.This current blog post reveals the work involved in digitizing this unique piece of Canadian history. Library and Archives Canada’s (LAC) digitization staff are accustomed to handling a range of objects, such as documents, photographs, negatives, microfilm, paintings, maps and books. Occasionally, non-conventional objects present unusual challenges, such as the digitization of the Lord Grey banner, a tall embroidered banner in fragile condition. Due to limitations in the existing digitization equipment and the size and condition of the banner, the technicians needed to come up with some creative solutions. 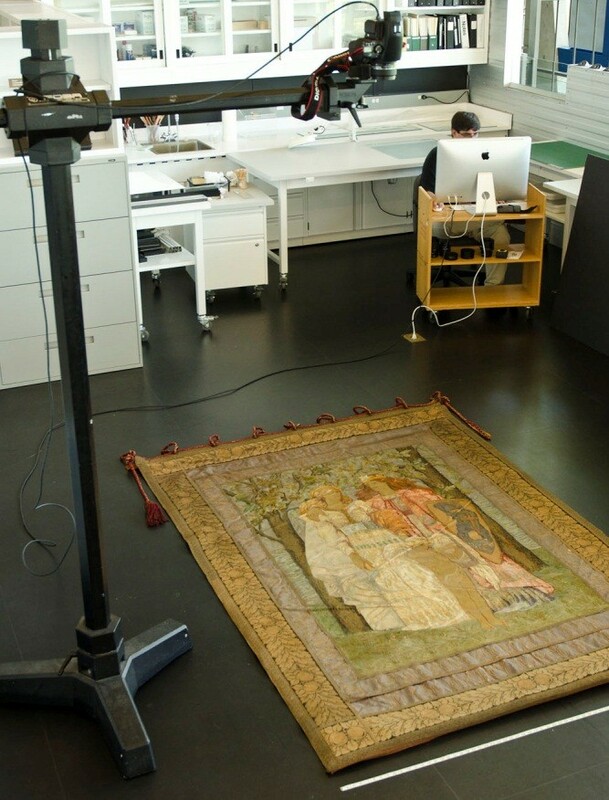 To minimize the amount of movement, the banner was delivered from storage to the photo conservation lab in LAC’s Preservation Centre in Gatineau, Quebec. As it could not be hung vertically, it was placed on the floor in an evenly lit open space. The camera is positioned above the banner, which is laid on the floor. Images of the banner were taken using a Phase One 645 DF+ medium format digital camera mounted on the largest camera stand available. With the camera suspended seven feet away, the banner was captured in eight separate sections and the images reassembled using Photoshop for a complete view. Switching to a 150 mm macro lens, the camera was then lowered to get a selection of detail shots showing the many parts of the banner, such as the signature on the back, the shield with St. George and the dragon, and the types of stitching used. When the front was fully documented, the banner was turned over so that the back could also be captured. 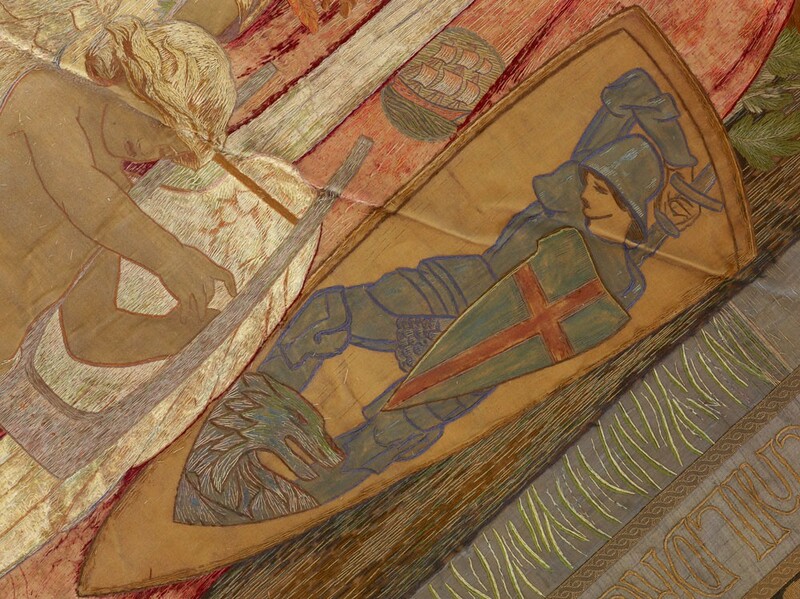 Part of the fabric depicting St. George, patron saint of England and the dragon. The digitization work was undertaken to create a visual representation of the banner, providing the details of its design and the beautiful workmanship. LAC has now created a permanent digital record, making the banner accessible online, reducing the need to handle the physical item and thereby ensuring its long-term preservation. Visit our Facebook album to see what went on behind-the-scenes to digitize this banner. This entry was posted in Digitization, Our Collection and Facilities and tagged Banners, Conservation, digitization, Governor General of Canada, Lord Grey, Photographic equipment by Library and Archives Canada Blog. Bookmark the permalink.